Move into the great, wide wireless world with JVC's KD-BT1 CD receiver, courtesy of built-in Bluetooth® technology. The KD-BT1 lets you enjoy hands-free calling and play music files without any connecting wires using your compatible phone. But Bluetooth is just the beginning of the story for this capable car receiver. A high-quality Burr-Brown digital-to-analog converter delivers pristine musical reproduction, and the built-in amplifier delivers the power you need to make your speakers sound great. JVC's 3-band iEQ equalizer gives you plenty of ways to adjust the sound to your liking. The KD-BT1 plays discs loaded with MP3, WMA, and AAC files, and features a USB input for connecting a portable music player or thumb drive. Check out the wide variety of entertainment options. You can add an optional adapter that'll allow you to control and charge your iPod®, or you can add a satellite radio or CD changer to further expand your choices. Building a bigger system? Use the stereo's three sets of preamp outputs to connect external amplifiers. Note: If you're going to use your iPod with this receiver, be sure to check "Details" for specific iPod model compatibility with this receiver or its optional iPod adapter. This unit works great i have had it six months and it was a easy install and setup the bluetooth works great without echo on my motorola v-365 i put my phone on automatic linkup so when i get in my truck it picks it up and thats it great unit. Variable-Color 3D Graphics: This unit features a full-motion 3D graphics display with variable color backlighting. Using the palette of 12 preset colors (Aqua, Sky, Seas, Leaves, Grass, Apple, Rose, Amber, Honey, Violet, Grape, or Pale) and adjustable red, green and blue levels, you can customize the display background with one of 1,728 possible color variations. You can also choose Every (the color changes to a preset color every 2 seconds) or User 1, 2, or 3 (created by your own levels of red, green and blue between 0 and 11). You can select a different color for each source, or a single color for all sources. In addition, you can select one "user color" for daytime use and another for nighttime use (when headlights are on). The display also features 3 audio level meters to choose from that reflect the intensity of audio frequencies being played. MP3/WMA/AAC Playback: The KD-BT1 can play MP3/WMA/AAC files that have been recorded on CD-R and CD-RW discs. The disc must be recorded in one of the following formats: ISO 9660 Level 1/Level 2, Joliet, Romeo or Windows long file name. You can directly access folders numbered 01-12 (they must be assigned two-digit numbers when recorded). Each disc can have a maximum of 8 folder hierarchies, 200 folders, and no more than a total of 512 files and/or folders on each disc. TI/Burr-Brown 24-Bit DAC: The JVC KD-BT1 utilizes a TI/Burr-Brown 24-Bit digital to analog converter for exceptional audio playback of your CD, CD-R, and CD-RW discs. Preferred Setting Mode: By activating the Preferred Setting Mode (PSM), you can set the clock, choose the time zone and daylight saving time, select the dimmer mode, select the external component type (changer or line input), turn on/off ID3 Tag display, switch between US standard and European tuning spacing, set the Amplifier Gain control (high/low), and several other operational settings. Amplifier Gain Control: When you are using the KD-BT1 with factory speakers (or those rated to less than 50 watts peak), the Amplifier Gain Control can limit the amount of power being sent to those speakers. When the Amp Gain Control is set to "low," the volume control ranges from 0 (minimum) to 30 (maximum). When using speakers rated higher than 50 watts peak, you can set the Amp Gain Control to "high," and the volume control will range from 0 to 50. Title Assignment: The KD-BT1 allows you to assign names of up to 10 characters for AM and FM stations (30 station maximum). In addition, you can assign a name of up to 8 characters to a connected external component. Direct Track Access: You can directly access CD tracks 1-12 by pressing the station preset buttons. If a preset button is pressed for less than 1 second, the track corresponding to the number on the preset button is selected (for tracks 1-6). When a preset button is pressed for more than 1 second, the track corresponding to the number above the preset button is accessed (for tracks 7-12). Subwoofer Output: In addition to 2.5-volt front and rear preamp outputs, the KD-BT1 is equipped with a separate 4.0-volt subwoofer preamp output. The outputs are non-fading, and you can set the cutoff frequency of the low pass filter at 80Hz, 120Hz, or 160Hz. The subwoofer level can be set between 0 and 8. Compatibility with Optional Input Adapter: An optional JVC Line Input Adapter (item # 105KSU57) or Aux Input Adapter (item # 105KSU58) may be used to provide an auxiliary input on this unit. This feature allows you to connect a portable audio player, such as a portable MP3 player, to this unit as an additional audio source. The adapter connects to the CD changer input on this unit. When the adapter is connected to this unit, a CD changer cannot be connected. Clock Display: While playing a CD, you can switch between the clock display and the CD elapsed time display (the track number always appears). When you press the Display button during power off, the unit will turn on, display the clock for 5 seconds, then shut off. This can be done with the ignition on or off. In the PSM menu, the clock can be set to display with the unit on or off, only turning off when the ignition is turned off ("keyed" operation). Display Dimmer: The display dimmer can be set to Off (normal brightness at all times), Auto (display window automatically dims when your car head lights are turned on), On (display and button illumination is always dimmed) or Time Set (set a desired duration for the dimmer between two custom times). Note: The amount of dimming is fixed, it cannot be adjusted, and the orange/white illumination wire must be connected for Auto operation. Disc Resume: If you change the source, playback also stops (without ejecting the disc). Next time you select CD for the playback source, the disc will start from where it has been stopped previously. Wireless Remote Control: The KD-BT1 comes supplied with a wireless remote control (RM-RK50). The remote contains Power, Attenuator, Sound, Source, Tracking and Volume functions. Factory Steering Wheel Controls Compatibility: The head-unit features a rear-panel 3.5mm minijack input that allows you to operate this unit from your factory OEM steering wheel controls via an optional adapter (127SWIJACK, sold separately). The SWI-JACK is compatible with over 95% of the vehicles made from 1986 to the present. Compatible vehicles include many Acura, Audi, BMW, Buick, Cadillac, Chevrolet, Chrysler, Dodge, Ford, GMC, Harley Davidson, Honda, Hummer, Hyundai, Infiniti, Isuzu, Jaguar, Jeep, Kia, Land Rover, Lexus, Lincoln, Mazda, Mercury, Mini, Mitsubishi, Nissan, Oldsmobile, Plymouth, Pontiac, Saab, Saturn, Scion, Suzuki, Toyota, and Volkswagen vehicles. Please consult "Outfit My Car" to see if your vehicle is compatible. 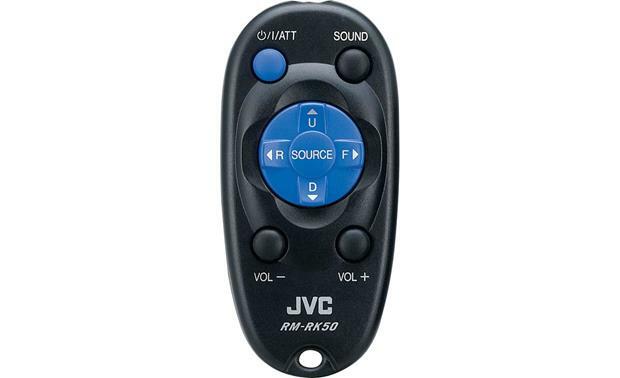 Built-In Bluetooth Wireless Technology: The JVC KD-BT1 supports the following Bluetooth Profiles - HSP (Headset Profile), HFP (Hands-Free Profile), A2DP (Advanced Audi Distribution Profile), AVRCP (Audio/Video Remote Control Profile), SPP (Serial Port Profile) and OPP (Object Push Profile). Bluetooth is a short-range wireless radio communication technology for mobile devices such as your cell-phone. Bluetooth devices can be connected without cables for communication between each other. The JVC KD-BT1 features a built-in Bluetooth receiver along with a wired microphone that plugs into the back of the head-unit which allows you to make and receive cellular phone calls through your Bluetooth enabled phone, or listen to a Bluetooth audio device via the KD-BT1's controls and your vehicle's audio system. The supplied microphone comes with a an adjustable mic-stand that can be mounted to a flat surface via the supplied two-sided tape or clipped to your sun-visor. You can register up to 5 Bluetooth devices to this unit, however, only one unit of each type can be used at a time. You can operate the following Bluetooth features through this unit. Making a call: You can make a call by entering a phone number from your JVC receiver's Dial Menu. Calling from phonebook: You can call a number from the phone-book in your connected cellular phone using your JVC head-unit; before using this function, transfer the phone-book memory of your cellular phone to this unit. Calling by voice command: If your cellular phone is equipped with the voice recognition system, you can make a call by your voice using the supplied microphone. Calling from call histories: The head-unit has three kinds of call histories - redial, missed calls, and received calls. You can make a call using these call histories through your JVC head-unit. Call Waiting: If your cellular phone is equipped with the call waiting function, you can put the current call on hold and answer the waiting call. Calling by preset numbers: You can preset up to six phone numbers for one touch dialing from your JVC receiver. Receiving the SMS (Short Message Service)/Text Message: If your cellular phone can use SMS and Text Message, you can read the message on the display of the receiver. Playback Bluetooth Audio: The built-in Bluetooth receiver also allows your JVC head-unit to playback audio wirelessly from your Bluetooth compatible portable audio player and operate the following playback options of your Bluetooth compatible portable audio player - Start Playback, Pause, Forward Skip, Reverse Skip and Stop. Note: Currently not compatible with the Apple iPhone. 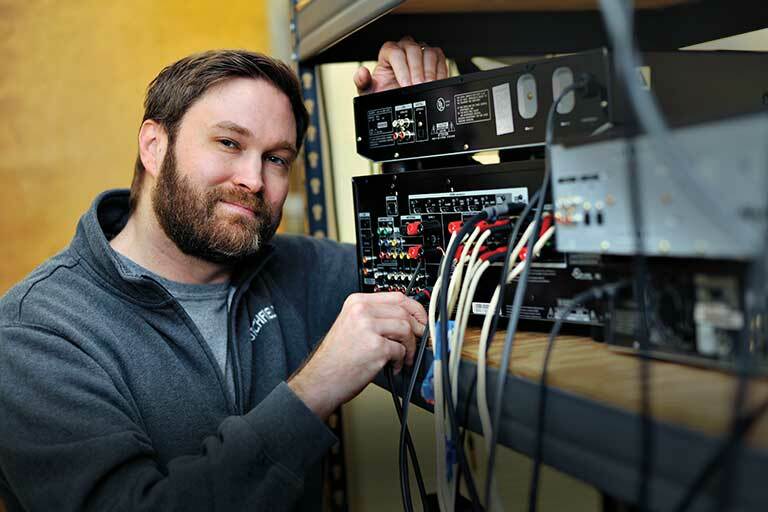 USB Connection: The JVC KD-BT1 features a full-speed 1.1 USB type-A port attached to the rear chassis by a 4' pigtail allowing for installation placement flexibility. You can connect a USB mass storage class devices such as a USB memory thumb-drive, Digital Audio Player, or portable HDD to the unit using this USB input. The head-unit can play MP3/WMA/WMA-DRM10/AAC/WAV files stored on your USB device and supports ID3 Tag information. You can operate the USB device in the same way you operate the files on a CD-audio disc. Note: You cannot connect a computer to the USB terminal of this unit. Optional Interface Adapter for iPod: The optional KS-PD100 adapter (item # 257KSPD100) allows an iPod digital music player with a dock connector to be hooked up to and controlled by the KD-BT1. You'll be able to scroll through all your playlists, albums, artists, genres, and composers directly from the head unit. Song titles and other file information show up right on the head unit display. The iPod is also charged while it is connected to the KD-BT1. Satellite Radio: This unit supports both XM and Sirius Satellite Radio when used with an optional satellite radio tuner and adapter, sold separately. 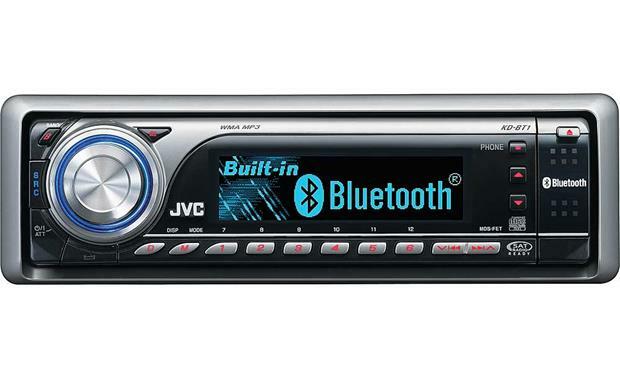 This JVC headunit supports the SiriusConnect Universal Vehicle tuner and JVC KS-SRA100 Sirius Satellite Radio interface (item number 700SIRJVC1, sold separately). The headunit also supports the XMDirect2 Universal Vehicle tuner and CNPJVC1 XM Satellite Radio interface (item number 700XMJVC1, sold separately). Changer Controls: This unit is equipped with JVC's "J-Link" CD changer control system. It is fully compatible with JVC's CD/MP3 changer (item # 257CHX1500). Other JVC CH-X series CD changers (except CH-X99 and CH-X100) can be controlled directly by this head unit, however, they are not compatible with MP3 discs. You cannot use the KD-MK series CD changers with this unit, even with an adapter.